Is Braak staging valid for all types of Parkinson’s disease? Braak et al. proposed that cases with Lewy pathology in the peripheral nervous sytem, spinal cord and brain stem are prodromal Parkinson’s disease (PD), suggesting a hypothesized progression of PD pathology. However, the putative potential of peripheral α-synuclein to promote brain pathology has been questioned recently. The Braak staging is a matter of vigorous debate, since < 100% of cases with Lewy pathology fitting the proposed PD staging scheme; however, most studies assessing typical PD cases show that the vast majority (80–100%) fit the Braak staging scheme. Incidental Lewy body disease and PD can show Lewy pathology in substantia nigra or other brain areas without involvement of dorsal motor nucleus of the vagus nerve. The Braak staging system is valid for PD patients with young onset, long duration with motor symptoms, but not for others, e.g., late onset and rapid course PD. The validity of Braak staging and its relationship to various subtypes of PD warrants further studies. 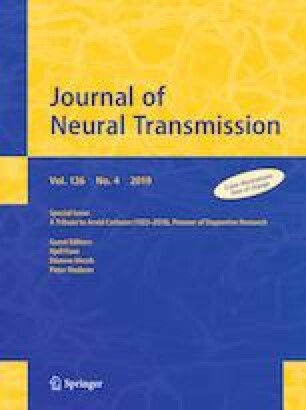 Dedicated to Professor Arvid Carlsson, founding Editor of the Journal of Neural Transmission, awarded the Noble Prize in Physiology or Medicine 2000, who will celebrate his 96th birthday on January 25, 2019.